Slave tag, 2-1/2”x2-1/2”, “CHARLESTON NECK 1850 SERVANT 338”. Clipped corners. Hole at top for use. Double struck “CHARLESTON NECK” Fine condition. 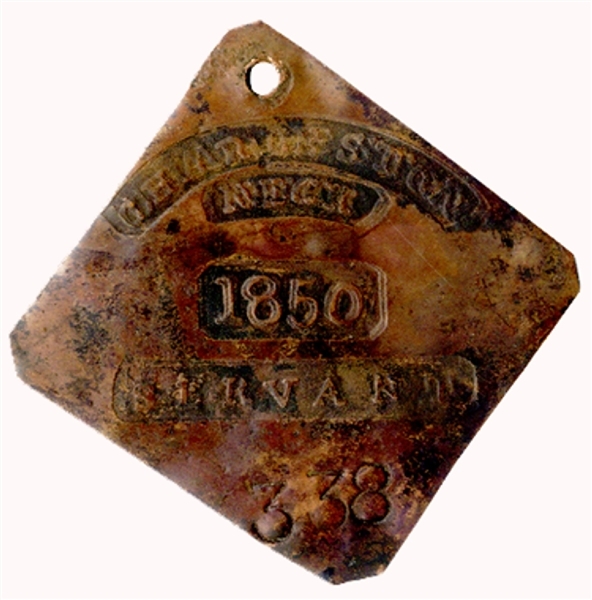 Badge laws existed in several Southern cities, urban centers such as Mobile and New Orleans, Savannah and Norfolk; the practice of hiring out slaves was common in both the rural and urban South. But the only city known to have implemented a rigid and formal regulatory system is Charleston. Perhaps the statutes in other cities were never enforced; perhaps paper badges, inherently impermanent, were issued instead. All of today’s extant badges can be traced exclusively to Charleston. There, from the mid-18th century to the end of the Civil War, ordinances dealt with the matter of owners marketing the labor and skills of their slaves by arranging for them to work outside the home or plantation.